Friday Fiction – Man, what are you doin here? This week’s FF photo nearly made me quit. I just couldn’t get the story to work – I had a few “scenes” which I tried out but none of them was really a story or worthy of the group. What I ended up with still isn’t made favourite ever, but I’ve decided to post it so let me know what you think. Alternatively, just go here to enjoy what a clever writer can do with 300 words and a piano man. Man, What Are You Doin’ Here? 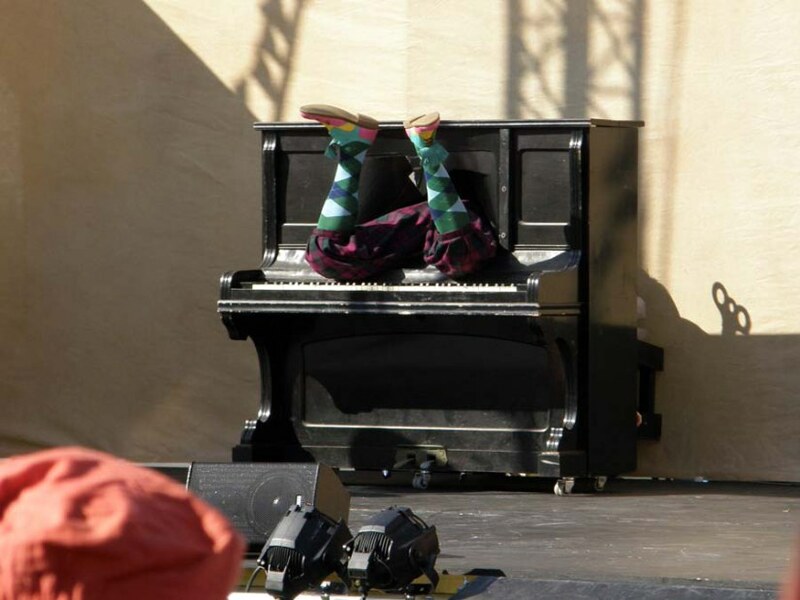 “I’m worried he can’t reach the pedals from there,” said Darren, indicating a joke piano with two legs sticking out of it. Miranda felt a giggle creep up from her stomach. The whole date had been a disaster, from the parking ticket on his car to the appalling service at the restaurant. But then, what was it they said about friendships formed in foxholes? “That’s not funny,” she said, holding back the laughter. I liked this – you caught the comic moment beautifully. I’ve never heard of ‘friendships formed in foxholes’. Something new for me. I actually read that phrase this morning on another site, so I don’t know how common it is, but the idea is friendships are cemented in adversity. I figure a bad date could kind of bond two people that way! I think the saying refers to the bond formed between soldiers during World War 1 when troops were pinned down for days, weeks and even months and had nothing to do but develop friendships. She certainly is binding over the escapades of their date. I was thinking the bonding was more to do with adversity than boredom. In this case, the bad date turns out to be a good way of joining two people. Nice capture of this special moment! I see you’ve been on those dates, too. It’s like laughing at a funeral, though, isn’t it? Nicely done. Some of my best relationship moments have been the tough times, though, hence the foxholes comment. Fun last line! Nice that she still was able to make a joke after the disasters in the date. I think you caught the idea that sometimes things just go so badly that you just give up, go with it and have fun. For me, or the characters, Janet? either way, you’re right and it seems to have turned out ok for both! Hahahahahaha! Excellent, Jenn! Just what the doctor ordered. Wonderful! Ah! I like that that crazy piano saved the date. I predict marriage in their future and I hope somebody gives them that piano as a wedding gift. Haha, early days yet, but who knows, Linda! I’m glad my photo was able to help them salvage the date. 🙂 Thanks for the link. At least it wasn’t all bad! Thank goodness for humour. It’s good they’re looking on the bright side of things. Hopefully they can have a second date that goes better. I hope so too, David. Seems like they go well together, doesn’t it? An enjoyable piece. I’m sure I’ve heard the foxholes phrase before, but it must have been a long time ago. Ah the proverbial blind date that didn’t. Nice the way, in the end, they were able to see the humor in it. Perhaps, they would make a second date and turn things around. Seems like a nice beginning for something larger. Nice work. A moment in time – captured perfectly. Well done! Glad you stuck with it – that was worth it!! Thanks for the laugh. Made me smile, I liked the fact that the thread holding the flash together was a dating disaster! Corny is sometimes best. You’ve captured the beginning of their relationship perfectly. Nice take. Wrestling with your muse paid off. I’ve been on enough bad dates to like the prospect of making the best of one. The play-play piano crowned the disastrous date. They had to laugh at themselves! Nice! Very clever. Your story matured well! I loved this piece. Especially the final line, “He really gets into his music!” Hilarious! Every time I think of it and picture the piano, it makes me giggle. I wish I’d thought of that line! Very well done!